I wrote those words on my status, then glanced, for a long time, at the picture of your two-year old self. In an instant I saw your newborn self, pink like the magnolias in bloom outside our sunlight-filled hospital room. I saw your chubby six month self, with more chins and rolls and dimples than any one mass of skin has ever held. I saw your first steps, taken on your first birthday. I saw your eyes of delight whenever your dad or big sister would come home from work or school. I saw your eyes of amazement, as you’d sneak into the room your little brother was sleeping, to wonder at his tiny hands. I saw your elfish preschool grin. I saw your eyes of delight whenever you spied a living thing, from fish, to birds, to creatures with fur, to our gruff neighbor, whose heart you melted, again, and again, and again. I saw you jumping on the trampoline, with friends, big as our six foot tenant, small as the slugs that you thought would like to jump. I saw your eyes of delight when you entered your kindergarten class … so many people to befriend! I saw your face, smiling at your neighbor friend, over chicken strips in my kitchen. Then I saw your tears, as elementary school was done, and you did not want to leave that place of memories. Then I saw your tears … adolescence can be such a tough time of navigating body, mind, soul, family and friendships. Then I saw the times of giggling, events, firsts, friendships … friendships, never was age, gender, size, color or any other differentiator a barrier for you. Then I saw your head turn, as a boy passed you by. Then I saw you drive off in a vehicle, without an adult. And now, you are eighteen. You are eighteen, no longer my little girl. In a few short months you will conclude your years of high school, graduating on to study that which is a passion in your heart. But, when I look back at your life, my heart always returns to that seven-year old day … when I saw you dance, between the sunbeams of the giant trees, in your white lace crinoline from the dress-up box … twirling and spinning, with great abandon, dancing to your own music, your own tune. 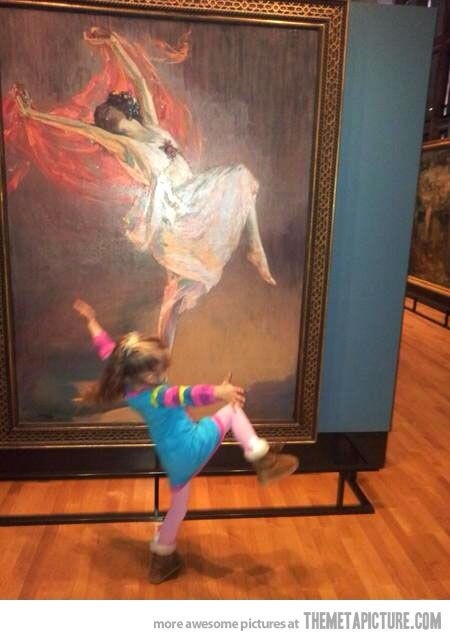 From birth, you have danced to your own tune. From your belief that sleep was not essential (for your first two years), to your embracing of friendships from anyone (no matter the difference), to your strong will, you have refused to be anything other than who you feel convicted to be. Though this has, at times, resulted in tears (and this will not change, in this life), I know that you will never have regrets for things you have not done.